Coins from sunken treasure ships can be very appealing when we think we're getting a bargain, or we believe that they will increase in value quickly. However, the more hype you see surrounding a shipwreck coin treasure sale, especially when it comes to a famous lost treasure ship, the more likely it is that the coins will decrease in value over time. Basic economic principles teach us that supply and demand determine an object's value. For the value to increase over time, the supply must decrease, or the demand must increase. Rapid growth in value happens when both of these events occur simultaneously. The discovery of a new shipwreck full of coins will affect both supply and demand. 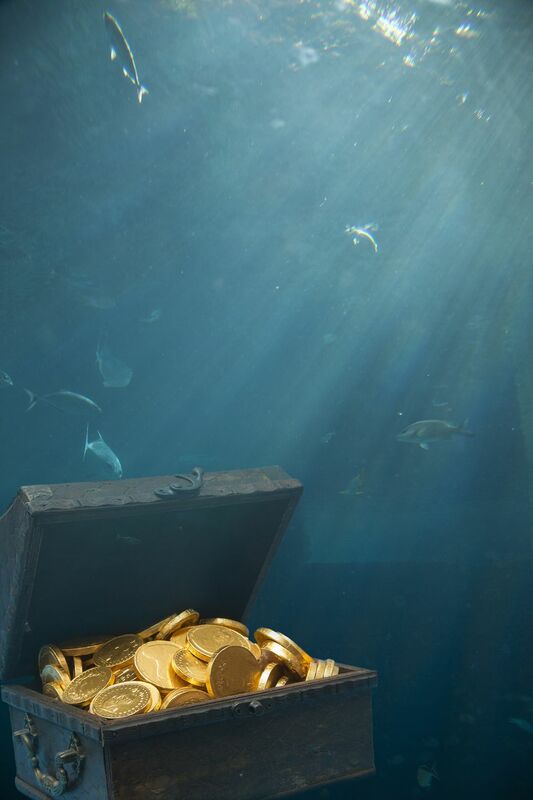 When sunken treasure coins are brought up from a long lost shipwreck, it's an exciting event for many collectors. Sometimes lots of new material comes on the market, giving you a chance to get a key coin or rare type that was never affordable before. But think before you buy: Are the prices being inflated temporarily by all the hype surrounding the find? Are you paying a huge premium just because the coin came from a famous shipwreck such as the SS Central America? Will anyone care about this five years from now? Odds have it, that after the excitement dies down demand for these shipwreck coins will decrease and so will the price. One of the things that make many coins valuable is their rarity. When lots of new specimens of a rare coin type hit the market, the value of the coins usually deflates due to the increased supply. At first, the dealers will probably get the "old" price and maybe even a premium because it came from a famous shipwreck. Over time, with more specimens on the market, the values of the coins almost always decreases due to increased supply. Treasure coins do not have a good history of holding their value based on treasure status alone. Another thing to consider with sunken treasure coins is their condition or grade. Often, being underwater for centuries degrades the condition of the coins. Bronze coins suffer the greatest in salt water; silver coins can vary depending on the purity of the silver. Gold coins of good purity usually survive mostly unscathed. Look at sunken treasure coins carefully before buying, and assess the coin's value based on its grade without its accompanying sunken treasure slab insert or authenticity certificate. Experts recommend if you are buying coins from a shipwreck as an investment, buy only the highest grade coins. As a general rule, this means buying MS-64 or better specimens that have been graded and slabbed by a reputable grading service. Since many sunken treasure coins don't survive their ordeal well, the promoters often sell off the lower-grade material in fancy holders and plaques that try to imply that the condition doesn't matter because this coin is from a famous shipwreck. Don't fall for it! When you are deciding if a coin from a shipwreck is worth the asking price, you must evaluate the coin on its own merits. Forget about the shipwreck coin status and other marketing traps. Just look at the coin, determine the grade, look up the value, and make your decision while keeping in mind that a lot of these coins might be flooding the market soon. Better yet, wait four or five years and buy it on the secondary market at a deep discount after the market has stabilized and the excitement has receded. If you are serious about collecting recovered treasure and sunken treasure ship coins, take some time to educate yourself about the realities of these coin types. They're probably a lot more common than most people realize, but if you want to invest in this type of material, learn what the numismatic rarities are, what the "common junk" is, and the grades of the average specimen. One of the better books on the subject of Spanish coins, which are the most common treasure ship coins, is a book by Sewall Menzel, called Cobs, Pieces of Eight, and Treasure Coins. Another excellent book on the subject, but hard to find, is Stephen Voynick's Mid-Atlantic Treasure Coast - Coin Beaches and Treasure Shipwrecks from Long Island to Maryland's Eastern Shore. This book is more of a background on the subject, rather than an accounting of coin specimens like the Menzel book.